Horrified? Let me tell you why- I reiterate the same point over and over. I think that a lot of people, especially in this country, believes that lions are in endless supply. Remember Cecil? All of us were extremely horrified by what happened there. Cecil the lion was killed in such a blatant, sick, greedy way and even thinking about it makes a person sick. That article above also brings a lot of sick images to a person’s head. Since the death of Cecil, lions have been disappearing at such a rapid pace that any day they will fall into the ‘Critically Endangered’ stage. Is that what all of you want? Is that what you want Africa? Consider this blog post a plea to Africa, I want you to consider what you’re doing here. 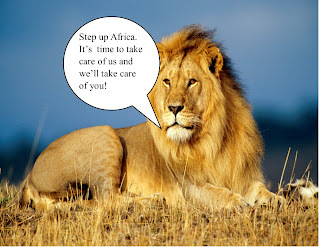 Lions, elephants and gorillas are vanishing, and your entire continent will soon be only known for the Sahara Desert. I ask you, in all sincerity, is that what you want? To have every valuable resource disappear? Do you realize a lion is one of the reasons people want to go to Africa? Do any of you appreciate the idea of tourism? It’s about time that you wake-up and realize what treasures you have. You, like other countries, need to consider that you can’t keep moving into an animal’s environment without considering how impacts them. Africa, why can’t you be the leader here and make sure that these animals get more protection. Once you do that, the obvious will happen, the overall environment gets better which leads your country to prosperity. Roar for the lions Africa. Make Mane Mondays there your first step and help protect the lions you have so they’ll always be here for us!